KHJ - Nostalgic Post, The First Time. Just found my long lost file...and guess what's in it ! 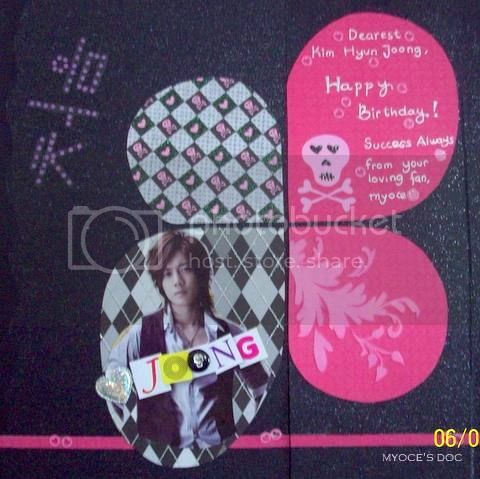 Yupz...photographs of my old HJ's Bday scrapbook, the first scrapbook page I ever made for HJ's B-day sent through LKHJ. Even though the pics are not too sharp, I'm posting them anyway...for my record. Glad that now I have the complete set...first one here in this post, second one here [where I actually have some stories about making the first one, the one you see here], and the third one, here. So the theme of our scrapbooks was "The First Time" ...yup, the first time, alright. 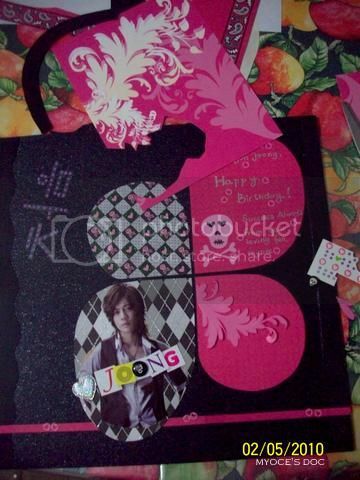 First time for LKHJ to send KHJ something on his Bday, also first time I ever made a scrapbook. bb was still heading LKHJ back then, she warned everyone of going overboard buying scrapbook supplies and told us to decide on a design first before going shopping. Sound advice....but too late for moi !! 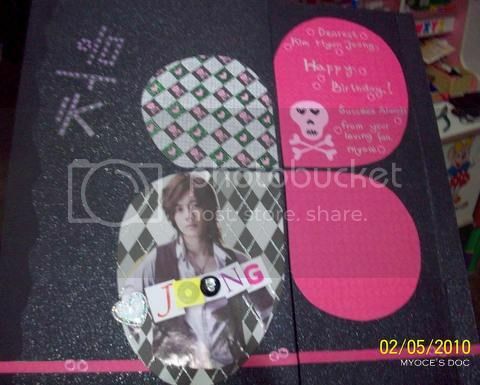 ^_^ Eager to start scrap-booking for KHJ, I had already bought scrap-booking materials enough for HJ's Bday scrapbooks till he turns 50 !! My bad. 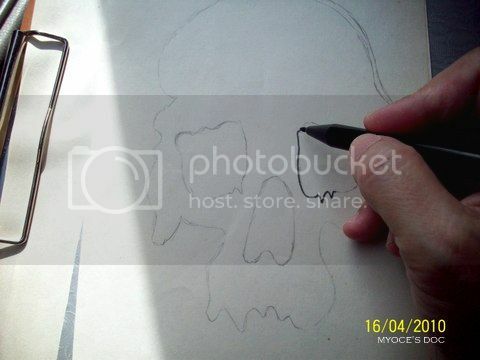 I didn't know what I would make...but coz KHJ loves skulls, I decided to draw some first. 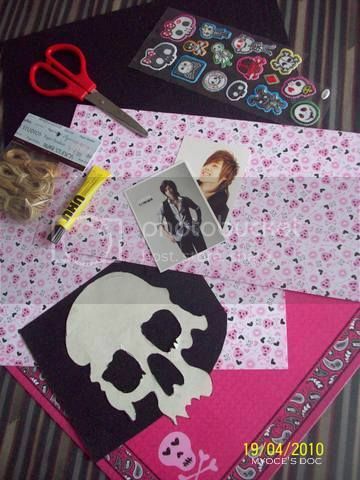 Anyway, after sorting out my supplies, I googled scrapbook samples looking for ideas.....hmmm so many to choose from. Spent several days ogling designs until settling for a design that I thought was simple and not impossible for me to make. 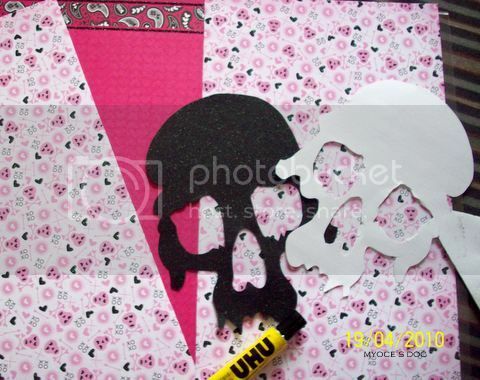 Finished drawing skulls, I looked through my scrap-booking supplies and chose several colors...HJ loves black...so I decided black would be prominent and of course, skulls...and pink, coz I'm a female hehe. Above and below are some of the colors and and the stickers I chose, tho at the end I decided not to use the pink and white skull paper and used other papers instead. Got so busy measuring, cutting, and gluing that I forgot to take pictures of the other materials used and the progress made. Thought I needed more skulls...so, made a black skull too. I had decided on a sorta asymmetric butterfly design and wanted to decorate the "wings"...[looking at the design now....I think it would have been better if I alternated the pink color. 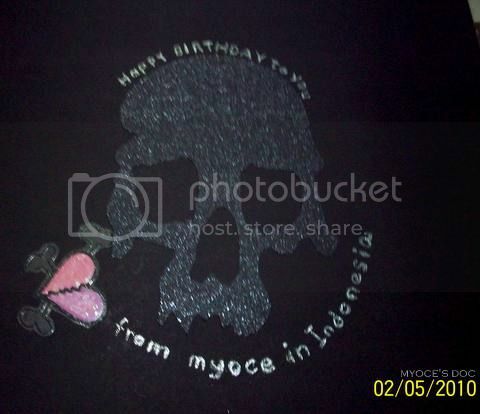 Oh well..] Stuck a pic of HJ and wrote my Bday wishes on one of the wings...it still looked lacking. I had to travel to Timor at this step of the scrap-booking. Bundled up my scrapbook and supplies and hopped on a plane. A few days after I arrived...time to continue the project. so, cut up some swirls and glue them on. 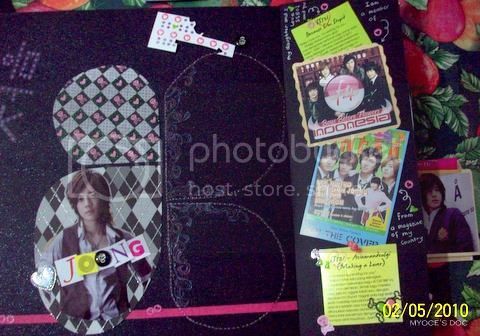 Because I had decided I wanted to write more to HJ, I made the right side of the scrapbook page to be a "flap" Which HJ could open. Now is the time to decorate the inside part of that "flap". 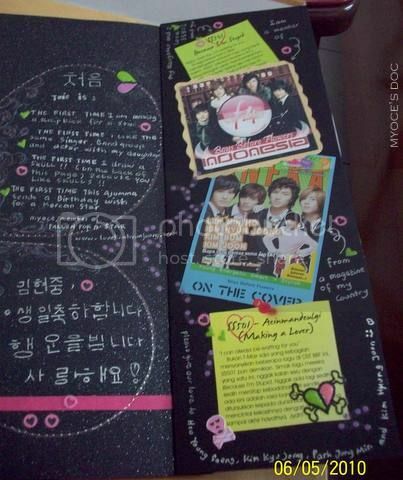 The right side I filled with pics from Indonesian magazines, of course it's in my language, but I thought HJ would appreciate that. 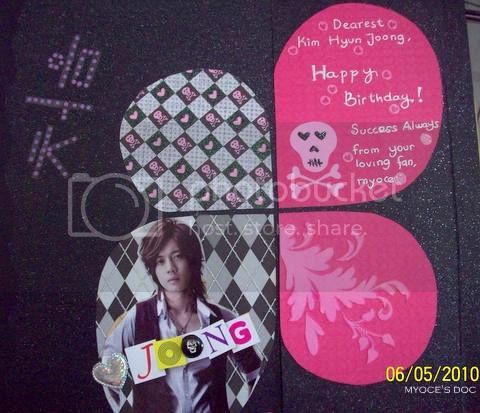 On the left side of the flap I traced the "butterfly wings"
with silver and color markers and wrote many things for HJ. Hm....it wasn't neat at all.....I wrote outside margins a lot. couldn't pry them loose...so let them be. 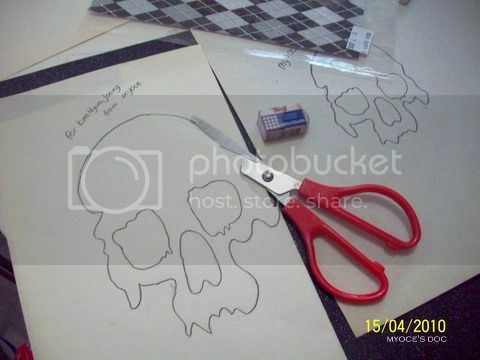 Wondering where those skulls I drew and cut out, huh? Yep...I didn't get to use them....and felt disappointed. Hahaha...yep...I got to use one of the skulls !! but I loved making it. See you in another post...have a nice day.